Sydney, Australia: Earth Hour’s founding city of Sydney, Australia has helped launch the 2010 event with another resounding participation in the now-global call for a more harmonious relationship between humans and nature. The event in Sydney was heralded – as usual – with the lights going out on the Sydney Harbor Bridge and Opera House with other major landmarks in State capitals and nearly 150 other communities joining in. Melbourne had an equivalent double with historic Flinders Street station and modern icon Federation Square going dark, while in Brisbane, the lights went out on the city’s Storey Bridge. Beers by candlelight in pubs across the vast country were accompanied by cheering as the lights went out. Events being staged ranged from meditation sessions towards a better world to beach parties. Earth Hour had got off to a much quieter start in the remote Chatham Islands, close by the International Date Line in the western Pacific, when residents turning off diesel generators became the first of an expected hundreds of millions to turn off lights in a global expression of concern over climate change. By the time, lights are turned back on in Samoa 26 hours later (due to a kink in the International Date Line), the tiny Chatham island’s community of about 600 will has been joined by seven of the world’s ten largest cities - Shanghai, Mumbai, Beijing, Sao Paulo, Seoul, Moscow and Dehli. "Earth Hour provides a global platform for millions of people to voice their concern about the devastating effects of climate change," said WWF Director General James Leape who is on hand to help turning off the lights in Beijing’s Forbidden City. As the event launched, a record 125 countries and territories (up from 88 in 2009) and over 4000 cities, towns and municipalities (1200 more than at the commencement of Earth Hour 2009) had signed up to join the event. “When Earth Hour started in Sydney in 2007, we never in our wildest dreams imagined it would catch on like this,” said Founder and Executive Director, Andy Ridley. Auckland’s Sky Tower, a consistent Earth Hour supporter, has switched to more energy efficient LED lighting for its upper section since last year’s Earth Hour. The 328 metre tower, New Zealand’s highest human-made structure, staged a build up to Earth Hour by switching off for incrementally longer periods all this week. The new LED lights signaled the start and finish of Earth Hour with light shows in the Earth Hour colors of green and blue. Nearly 50 cities, towns and rural districts in New Zealand participated in Earth Hour, with other major landmarks going off including the Beehive and Parliament buildings in Wellington, the Hawkes Bay Opera House and the Giant Kiwi Fruit in Te Puke. Noted NZ film director and comedian Taika Waitiki said "If we can make a huge change with just one finger flicking a switch imagine what we could do with two fingers...a hand... an arm and a leg....four legs....sixteen arms, three heads and a long tail with a huge spiked ball on the end... just imagine what we could do with a creature like that". Former New Zealand Prime Minister Helen Clark, now heading the United Nations Development Program, said "In 2008 I launched WWF-New Zealand's first ever Earth Hour in Christchurch. Its message was simple but powerful : that our individual actions may be small, but together we can make a difference. Lights went out but many televisions stayed on in Fiji, as residents followed the lead of Fijian sevens rugby captain, Emosi Vucago, amongst the first to sign up to Fiji’s Earth Hour. Fijians followed their team take part in the Hong Kong Rugby Sevens tournament by candlelight, with the result a resounding 45-7 win against Portugal. For those not quite so addicted to rugby, there was a concert at the Ratu Sukuna Park in Suva, launching the theme of “Going beyond the Hour”. Among those outlining energy saving measures in the longer term were Pacific area US embassies. In Tuvalu, one of the nations most threatened by climate change due to rising sea levels, government and people are trying not just for a light free Earth Hour but for a completely carbon neutral Earth Hour. Power will be cut to the entire island nation, lights and generators on boats in ports across the country will be switched off and car drivers and motorcycle riders will be urged to stay off the roads. Earth Hour is a global WWF climate change initiative. Individuals, businesses, governments and communities are invited to turn out their lights for one hour on Saturday March 28, 2009 at 8:30 PM to show their support for action on climate change. The event began in Sydney in 2007, when 2 million people switched off their lights. In 2008, more than 50 million people around the globe participated. In 2009, Hundreds of millions of people in more than 4,000 cities and towns across 88 countries switched off their lights for one hour. WWF is one of the world’s largest and most respected independent conservation organizations, with almost 5 million supporters and a global network active in over 100 countries. WWF's mission is to stop the degradation of the earth's natural environment and to build a future in which humans live in harmony with nature, by conserving the world's biological diversity, ensuring that the use of renewable natural resources is sustainable, and promoting the reduction of pollution and wasteful consumption. China has shown today that it is ready for transformation and a shift into a greener future. Symbolizing the drive towards a low-carbon economy, 34 Chinese cities, including Beijing, Shanghai, Chengdu and Dalian took part in the global Earth Hour event. Along with the rest of the continent China sent a clear signal that it is not only willing to help tackle climate change but it also wants to lead the process. The main event took place in the 600-year old Forbidden City with the China Office Representative Dermot O'Gorman, Chinese actress Li Bingbing and WWF International Director General Jim Leape participating in the lights switch off that made the historic place go dark for an hour. “Tonight, hundreds of millions of people are raising their voices by turning out their lights. It is a simple act, but a powerful call to action," Jim Leape said. China overtook the United States as the world top greenhouse gas emitter.. but it has taken clear action to tackle the problem. Recently it emerged that China had topped the US and other G-20 members in 2009 clean energy investments and finance. By 2020, the country will obtain 15 percent of its primary energy from renewable sources. And with development running ahead of schedule, that figure could be closer to 20 percent. Mei Lan – China’s recently returned panda is this year’s Earth Hour Global Ambassador. Along with 13 million residents of her home town Chengdu, Mei Lan has also taken part in 2010 Earth Hour. “China has incentive to act on climate change and it already does so. Earth Hour is yet another example of it,” Mr Leape said. Elsewhere in Asia the enthusiasm for Earth Hour was equally great. Philippines once again topped the charts when it comes to city and town participation with 1044 towns, cities and municipalities rallying behind the event. Phillippines have also become masters of the Earth Hour FlashMob dance. Over 100 eager, energized volunteers showed up to dance practicing through heat and the occasional drizzle paid off in spectacular performances. When the first dancer started waving an Earth Hour flag - people stopped to take notice. The dances culminated in a gigantic number 60 formation, signalling the 60 minutes of the Earth Hour. Encouraged to get involved in different ways, including eco-outdoor evening parties, hunting for recyclables and switching off TV sets an estimated an 15 million Filipinos participated in this year’s Earth Hour. The Quezon memorial, located in the old Filipino capital of the same name, and a symbol that represents the three major regions of the country, switched off as well on Saturday night, in a symbol of unity of purpose in calling for action on climate change. In Japan the Tokyo Towers and the Hiroshima Peace Memorial went dark at 0830pm while in Nepal, local Committees and authorities organized a programme there where students and locals came together for a candlelight vigil by the Bouddhanath Stupa, one of the most famous and revered stupas. In India across the country, Earth Hour has reached out to schools through at least 20 WWF state offices which are directly engaging with schools through which an estimated a 100 000 youth have been introduced to the global call for action. Delhi, Mumbai and Bangalore were the official Earth Hour cities this year. The main event was held at the India Gate- which also dimmed its lights in support of Earth Hour.. The Indonesian Tugu Jogja was built around one year after the construction of Yogyakarta Kingdom. At the early time of its construction, it clearly described the philosophy of the unity of God's creatures that means the spirit of togetherness of lay people and authorities to fight colonials. Tonight, according to the Javanese term, the spirit of togetherness the lights went off at the Tugu Jogja. In addition to turning off the lights of all cities’ public buildings, Seoul City designated some of landmark buildings and icons to switch off, and distribute about 30,000 Earth Hour posters in public notice boards. “The message of Earth Hour is simple,” said South Korea’s best known international citizen, UN Secretary General Ban Ki Moon. “Climate change is a concern for each of us. Solutions are within our grasp and are ready to be implemented by individuals, communities, businesses and governments around the globe. “Earth Hour is both a warning and a beacon of hope. By switching off non-essential lights for an hour, people will join a symbolic display that can inspire the change we so urgently need. In Brunei participation has been encouraged from a young age, and been very impressive, with campaigning being undertaken in every school in the country, in partnership with the Science, Technology and Environment Partnership (STEP) centre, who have set up energy clubs in many of the country's schools. In addition, one of the great symbols of the Sultanate, and one which dominates the skyline of the capital city of Bandar Seri Begawan, and one of the most impressive Mosques in all of Asia, the Sultan Omar Ali Saiffudin Mosque, will switch off its lights, along with a number of other government buildings and businesses. Moscow, Russia - Muscovites followed a rhythm all their own to Earth Hour, bringing in world renowned percussion group STOMP – who use everyday objects as musical instruments and who have made a name for their ways with dustbin lids – to run a masterclass come concert as part of their Eastern European tour. But Earth Hour in the world’s largest country, had actually started 11 time zones earlier, with citizens of Petropavlosk-Kamchatksky turning off their lights at the same time as citizens of Fiji. Mongolians also joined in Earth Hour for the first time, with an amazing – and hardy – crowd of 3000 turning out in freezing temperatures in monumental Sukhbaatar Square in the capital Ulaan Batar. In the Kazakhstan capital of Astana, the lights went out on the national icon of the Astana-Baiterek Monument as well as other public buildings including the Presidential Palace, the Supreme Court building and the Independence Palace. About 90 Kazakh cities and towns joined in the global Earth Hour campaign. Most of Moscow’s notable bridges joined the city hall, Moscow University and Grand Sports Arena at Luzhniki and other attractions in turning off for Earth Hour. Also turning off was Lushniki’s Small Sport Arena. The President and Prime Minister switched off the lights in their homes to lead Pakistan’s first involvement in Earth Hour, joining citizens in Islamabad, Karachi and Lahore. Said President Asif Ali Zardari, “Conservation of natural resources and essential commodities is critical to creating a sustainable environment.” The National Assembly and numerous hotel chains joined in Earth Hour in Pakistan. Television Maldives (TVM) went off air during Earth Hour and an officially sponsored walking tour was staged. Tourism hotels and resorts also supported the event. Oil may have funded many of the modern marvels of architecture in the Arabian Gulf area, but there are signs that Guld States are beginning to cast around for a stake in the growing renewable energy economy. Leading the switch is United Arab Emirates capital Abu Dhabi, now constructing the Masdar eco-city. There, the Sheik Zayed mosque - the country's largest and capable of holding some 40,000 worshippers, will be the leading icon of the Earth Hour message. Not far south, in Dubai, the highlight of participation will be the worlds tallest building, the 828 metre Burj Khalifa. Also going dark will be a more familiar symbol of Dubai, Burj Al Arab hotel, also known as the Arab sail. In Bahrain, the Almoayyad Tower, which is aptly nicknamed the "Dark Tower" will switch off its lights as will the Bahrain International Circuit, home of the Bahrain Formula One Grand Prix – admittedly only a small gesture on behalf of a sport with elevated climate emissions. Natural monuments a spectacular backdrop to Earth Hour in Africa. With other continents specialising mainly on dramatising their climate change message with human monuments, Africa took central stage with natural monuments. Table Mountain, which dominates the backdrop of Capetown, South Africa was very probably the largest feature to douse its illumination for Earth Hour. Victoria Falls, the world’s largest waterfall straddling the Zimbabwe-Zaire border, would have come a close second. Area with less electricity or less reliable electricity tended to place more emphasis on activities other than switching off lights. In Madagascar, restaurants held candle lit diners, and a daytime carnival for kids took place in the streets of Mada. Train stations were a favourite choice for switching off lights, as they are often well lit, public and central. In Kenya, the Kenyatta International Conference Centre turned off lights and hosted a live concert given by Achieng’ Abura, African jazz singer, also Goodwill Ambassador for WWF Kenya. Istanbul, whose rich past includes world capital status under the names Byzantium and Constantinople, celebrated Earth Hour turning off the lights on the Bosphorus Bridge, joining Europe and Asia. The bridge, opened very nearly on the 50th anniversary of the founding of the Republic of Turkey in 1973, has since 2007 been fitted with a computerised LED display of coloured lights and patterns. Elsewhere in the city, Earth Hour supporters flocked to a candlelit, unplugged concert. Ancient and evocative monuments in the Sphinx and the Great Pyramid of Giza, Egypt and the Acropolis in Athens stood dark and silent witnesses to the need to act for a continuing civilisation for an hour tonight. The Great Sphinx, 73.5 meters high, is the largest monolith statue in the world and the oldest monumental sculpture known while its neighbouring Great Pyramid, is the oldest and one of the few surviving Seven Wonders of the Ancient World. The Acropolis in Athens, symbol of early experiments with democracy, is equally symbolic of humanity’s capacity for greatness. Greece showed its usual outstanding participation in Earth Hour with 251 cities, towns and municipalities taking part. In Thessalonika, Greece’s second largest city, the lights went out on the Statue of Alexander the Great who spread Greek civilisation over a wide area and the White Tower, a former Ottoman fortification since adopted as the city’s symbol. Prior to Earth Hour, Bulgaria and Romania have joined forces to bring about an exclusive video link event between the two countries. Entitled “Low carbon economy – business opportunities and challenges”, the event was organized by WWF, the British Council and the British Embassies in Sofia and Bucharest. On the night, a procession of people carrying candles and lanterns will march across the central part of Sofia, afterwards enjoying an acoustic concert in the heart of the city. In Bulgaria, the buildings of the National Assembly, The National Palace of Culture and Bulgarian National Bank were darkened for the occasion.. In Romania, lights were turned out on the Parliament Palace, one of the biggest buildings in the world and certainly the largest parliamentary building. It consumes in one hour what a household consumes in a year. Or what a small town of 20,000 people consumes in one hour. The lights at the Parliament Palace will be turned off by Luminita Tanasie, the Director of WWF Danube-Carpathian Programme Romania, together with Roberta Anastase, the president of the Romanian Chamber of Deputees. Other notable buildings to darken included the Romanian Athenaeum, the Romanian Opera House, the National Theatre in Bucharest and the National Art Museum. In Ukraine, capital Kiev led 16 other cities in observing Earth Hour for a second time. In Kiev, lights went out on the busy Kreschatik boulevard and the historic orthodox Christian Kievo-Pecherskaya monastery. The historical centre of Odessa, including the Opera and seaside boulevard, were also shrouded in darkness. All day long, in Kiev, people could watch movies in the city park, broadcast using alternative energy sources such as wind, solar and energy received by pedaling electro bicycles. Some 50 restaurants from the popular chain “Kozyrna Karta” welcomed people for a candle-lit dinner throughout Ukraine. In the city of Poltava, the Society of Astronomy invited local people for a “street astronomy” event to do a bit of star-gazing with the lights out. In Serbia, Belgrade’s Eco Musketeers once again moved into action just before Earth Hour. Armed with convincing arguments and Earth Hour promotional materials, they asked passers-by to switch off the lights at 8:30. In special Earth Hour boxes they collected messages for the authorities about the need to tackle climate change. The Eco Musketeers gathered by one of the central monuments of Serbian inventor Nikola Tesla (1856 – 1943). A national icon and one of the fathers of commercial electricity, Tesla was ‘recruited’ as an Earth Hour ambassador because his way of thinking and research was closely inspired by our planet. The Nikola Tesla monument will also sport an Earth Hour t-shirt. In Serbia’s second largest city, Novi Sad, Earth Hour crowds congregated at the historic Petrovaradin Fortress. At the Planetarium there, visitors were treated to a lecture on climate change and invited to gaze at a brighter set of stars. Paris, France - Paris city and arrondissement authorities turned off the lighting on around 240 monuments in a stunning contribution to the Earth Hour call for effective climate action last night. Going dark were more than 30 of the city’s famous Seine river bridges, with the river also temporarily ceasing to reflect the Notre Dame cathedral. Also with their lights out for the hour were the Eiffel Tower, the Arc de Triomphe, the Louvre and dozens of churches, statues and inner city monuments. Parisians were joined by citizens of most of France’s major cities, including Bordeaux, Lille, Lyon, Marseilles, Nantes, Nice Strasbourg and Toulouse . The big switch-off took place on the Champs de Mars, place Jacques Rueff, situated right under the Eiffel Tower. As part of the celebration, 1600 candles were lit shaping the number 60 and symbolizing the mobilisation of the Parisian people and their vote for earth. Participation was also up in Germany, where the lights went out for the first time on the Arc de Triomphe’s rival - Berlin’s Brandenburg Gate. The link between the two was French Emperor Napoleon, who marched under the Brandenburg Gate in triumph and is prominently depicted on Arc de Triomphe, completed long after his death. It is the first time both arches have gone dark together in the cause of a determined campaign to resolve the climate change issue. Other German monuments of note darkening for Earth Hour included Heidelberg Castle and Cologne Cathedral. "WWF is completely right. Everyone can do something. I am very happy to contribute because every single contribution makes a difference," said Roger Cicero, a German Jazz musician. Belgium also enjoyed another record participation in Earth Hour, counting some 274 cities, towns and communes turning off lights for an hour. In Brussels landmarks to switch off included the Atomium, the Eglise Royale Saint-Marie and the European Parliament and Commission, the city being the capital of the European Union. In Poland 33 cities participated, with top officials including the country's President Lech Kaczynski and Prime Minister Donald Tusk supporting the action. The eastern European state's capital saw its tallest building, the famous Soviet-era Palace of Culture and Science go dark tonight. Earth Hour is also supported by schools from around the country. "We have only five year to radically transform our economy and bring it on the green development track,” said Wojciech Stępniewski, the head of WWF Poland climate programe. “If we don't do it, we will have to face catastrophic consequences of climate change." "The clock is ticking and the time we have left will pass almost as quickly as Earth Hour." Across the Baltic Sea, struggling under an environmental burden of discharges from agriculture and shipping, Sweden boasted 203 city, towns and communities participating in Earth Hour. The Royal Castle in Stockholm headed the list of monuments fading into the night sky for the hour. Earlier in the week, Stockholm had hosted an Earth Hour conference pointing to the central role of cities in any successful resolution to the climate issue. Norway boasted the northernmost town to participate in Earth Hour, dimming its lights rather than extinguishing them to continue to provide some deterrent to prowling polar bears. 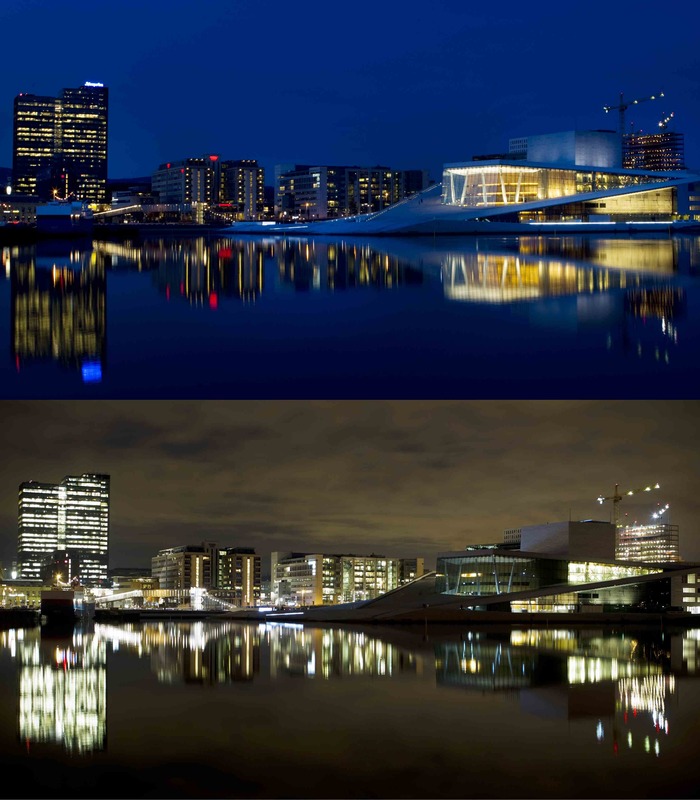 Some 161other cities, towns and villages demonstrated their vote for earth and call for action on climate change, including capital Oslo, where lights were extinguished for an hour at Oslo Plaza and the Postgirobygget. Lights were turned out on the Czech city of Telč and its UNESCO listed World Heritage historic town square during the country’s first Earth Hour participation, which covered 25 cities and towns across the country. In the second largest city of Brno, lights were turned off on the major landmark of Špilberk castle. Most major Swiss cities also participated, giving the tiny but complex country a representation of monuments for all of its linguistic groups – Lausanne Cathedral and Geneva’s Jet d’Eau Fountain, Zurich’s city hall and cathedral and Bellinzona’s heritage listed three castles. Rome’s most famous fountain, the Fontana di Trevi, turned off lights for Earth Hour calling for a more harmonious relationship between humans and nature. The Trevi Fountain shows Oceanus, the god of all water, standing on a large shell-shaped chariot pulled by seahorses. The legend says that if you toss a coin in the fountain over your left shoulder you will come back to Rome. The eternal city, sometimes known as the City of Fountains, faces challenges in the future from a drying Mediterranean basin as global temperature rises. Italian monuments turning off lights included the Palazzo Vecchio in Florence, the Castello Sforzesco in Milan and the leaning Tower of Pisa. Spain saw in Earth Hour with a Popular Race for the Planet finishing at Puerta de Alcala in Plaza de a Independence in Madrid, just before the lights were turned out on the ornate neo-classical gate. Said Laura de Morena after the event, “I am really proud to be one of the winners of the first race for the planet in Earth Hour. I think such initiatives are necessary to make everyone aware of the importance of fighting against climate change. Also turning off lights in Spain, thanks to an Earth Hour partnership with the national heritage body Patrimonio Nacional, are some of Spain’s most historic buildings including Royal Palaces in Madrid and elsewhere and the Alhambra of Granada. The rich tapestry of Spanish history is also reflected in the more than 170 cities and towns taking part, which include Toledo, Cartegena and Seville. Noted Spanish film director Pedro Almovadar had earlier come out and said, "Climate change is the greatest environmental threat that we are facing. “That s why I personally support with all my heart WWF ´s campaign Earth Hour.Switch off the lights. Turn on the earth". Portugal’s second largest city of Porto joined Earth Hour four the first time this year, turning off the lights on an impressive total of 43 of its monuments. Capital Lisbon, first global city of the country also turned many monuments’ lights off, including the Castle of Saint George, the Statue of Marquês de Pombal, the Jeronimos Monastery and the Belém Tower. Built as a fortress to guard the entrance to Lisbon's harbor, the Belem Tower was the starting point for many of the voyages of discovery. London could not match Paris in its turn out – or turn off – of bridges but some of the most famous Thames bridges did turn off for Earth Hour. They included the Tower Bridge, the most recent of the many London Bridges and Blackfriars Bridge. Big Ben made a second appearance on the Earth Hour lists. It may be only the third-tallest free-standing clock tower in the world, but as certainly the most famous, its countdown of climate danger needs to count for something. Other London icons participating included Buckingham Palace, Windsor Castle and the prime ministerial residence of Number 10 Downing Street. Scotland boasted a roll call of darkened attractions including Edinburgh and Inverness Castles, Holyrood House, RRS Discovery and the Wallace Monument in Stirling, the George Square Monuments in Glasgow, the Scottish Parliament . Former weather presenter Heather Reid joined WWF supporters and bagpipe playing Panda mascot for a light-show and countdown event at Scotland's most exciting example of 21st Century engineering - and the World's only rotating boatlift - the Falkirk Wheel. Another Scots innovation was Earth Hour golfing at – where else – the game’s birthplace of St Andrews. In Wales, lights went out on the Millenium Stadium and in Northern Island, Belfast City Hall went dark. “The largest ever number of countries, people and landmarks joined forces for Earth Hour this year. It was a visible demonstration of the enormous level of support there is around the world, for a united effort to tackle climate change,” said David Nussbaum, CEO of WWF-UK. Washington, US: With the official support of 33 States and Earth Hour being observed in all others and the national capital, the entire US has participated in the global Earth Hour call for effective climate action. South American colossus Brazil also recorded a remarkable surge in participation. Nations in the Americas joined a wildly successful Earth Hour which when complete will have seen hundreds of millions of people in more than 4000 communities in 126 countries participate – and all of those figures being subject to upward revision. "Earth Hour sends a clear message that Americans care about their country and the planet. By turning the lights off on pollution and climate change, we will make the switch to a cleaner, safer and more secure world," said Earth Hour US Managing Director Leslie Aun. Earth Hour in the US enjoyed the support of governors from both sides of the aisle, mayors, state legislators, government officials, business, religious and community leaders, university presidents and teachers. Sports figures, actors and models supporting Earth Hour 2010 included New England Patriots quarterback Tom Brady and his wife supermodel Gisele Bündchen, as well as two-time NBA MVP and Phoenix Suns guard Steve Nash have recorded public service announcements (PSAs) to help raise awareness of the significance of climate change action. Edward Norton signed on for the second year in a row to show his support for Earth Hour with a new video encouraging people to join the movement with him. Lights went out at one of the best lit places on Planet Earth – the welcome sign and strip at Las Vegas, Nevada. At least 45 other landmarks – from the Empire State building to the Golden Gate bridge – also marked the occasion. They included the Art Deco masterpiece of the Chrysler Building in New York along with the United Nations building. In Washington DC, the National Cathedral and Smithsonian Castle, which houses the administrative functions of the Smithsonian Institution, observed Earth Hour while in the other Washington, the Space Needle in Seattle faded into the night sky. The Queen Mary Hotel – a former Ocean liner – and Montezuma Castle, ancient cliff dwellings in Arizona, and Mt Rushmore, adorned with gigantic sculptures of US presidents, showed some of the range of monuments to turn off. Canada’s close associations were apparent in a joint turn-off of lights with the US at Niagara Falls. Nearly the last attractions to turn off in both countries were also notable suspension bridges completed less than a year apart – San Francisco’s Golden Gate (1937) and Vancouver’s Lion Gate (1938) bridges. 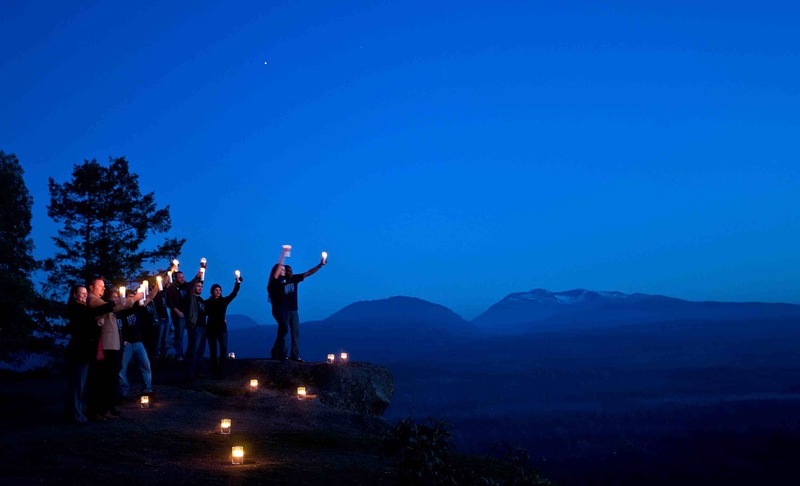 Canada has a tradition of strong Earth Hour support, and 2010, with some cites and towns taking part is no exception. World wide, only the motivated purveyors of the Earth Hour mob dance in the Philippines did better. However, the Canadians have their own customary concert and street party held in downtown Barrie, Ontario. Now in its second year, the event itself is in keeping with the theme of Earth Hour - to keep it fun, and to raise awareness about climate change - and is kept lively by international acts as well as local buskers, musicians and artists. In nearby Toronto, the CN Tower, the world tallest free-standing structure, again dimmed its lights for Earth Hour. WWF Canada intends to deliver messages from those taking part in Earth Hour 2010 to world leaders gathering in Huntsville, Ontario for the G8 and G20 meetings. One notable message is that all G20 nations this year took part in the global Earth Hour call for climate action. Mexico turned off lights for Earth Hour as a prelude to the city's year in the climate spotlight as the next UN conference on climate change approaches. The effort to pick up the pieces from the largely inconclusive Copenhagen Climate Conference last December will take place in the resort town of Cancun this coming December. The centre of Mexican Earth Hour celebrations was however at the centre of much of the country’s political tradition, around the Independence Angel - El Ángel – in Mexico City. The Cathedral, government buildings, other monuments and numerous fountains – including the Mexican Petroleum Fountain – were also darkened for the occasion. “The need for action remains extremely urgent, and the Cancun discussions must produce tangible results," said Vanessa Pérez-Cirera, Climate Change Director for WWF-Mexico. Forest focus in Brazil and Bolivia. Differing time zones meant that Brazil did not plunge into darkness as one, but the country registered its strong surge in Earth Hour participation, with three State governments, 20 state capitals in all the country’s macro-regions, and 98 Brazilians taking part. Adding to the support were 2,210 companies and 320 organisations. "WWF-Brazil is really proud of the participation of Brazilian people in Earth Hour 2010. It topped expectations and what we achieved last year. Movements like Earth Hour enable society to tell their leaders that they need to take action to save our planet", said Denise Hamú, CEO of WWF-Brazil. Rio de Janeiro switched off the illumination of some of the best known Brasilia icons in the world: the avenue bordering the Copacabana beach, the Sugarloaf mountain and the Statue of Christ the Redeemer. In the Botanical Gardens, Carlos Minc and the Mayor of Rio de Janeiro, Eduardo Paes pulled the switch that left the 'Wonderful City' in the dark. In the Brazilian capital Brasília – world heritage listed for outstanding modern architecture – the distinctive parliamentary buildings turned off for Earth Hour. More popular interest possibly was focused up the slope , where the Patubatê band was performing at the Terraço Shopping Mall. Shop owners also supported the campaign turning off their lights except for emergency exits. A key accent underlying Brazil’s Earth Hour events was the issue of deforestation, behind the largest proportion of the country’s emissions. Neighbour Bolivia also experienced something of a forest-based Earth Hour with the focal point being in the city of Santa Cruz where 150 companies and institutions involved in responsible forestry and trade in wood products took part in the annual Forest Exposition. For Earth Hour at the Forest Fair, the band Oxigeno performed an unplugged percussion concert, accompanied with fire jugglers, following which the best of the more than 200 stands at the fair received their prizes. "Deforestation is a major problem in Bolivia, and is responsible for four-fifths of all our carbon emissions" said WWF Bolivia's Conservation Director, Mr. Adolfo Moreno. In Colombia, Medellin – now again a centre of economic dynamism - Earth Hour was celebrated for the first time. Earth Hour in the city was devoted to underling the importance of sustainable economic development. Claudia Patricia Mora, Deputy Minister of the Environment, has seen Earth Hour as an invitation to all "to join together in one voice and (see) that our actions do not end here, we must preserve our environment with daily activities associated with minimum consumption of energy , fossil fuels and water." Earth Hour was also celebrated in Cartagena - the Heroic City – and in the Plaza de Bolivar, core of Bogota's historical centre. Largely driven by a Facebook event, residents of Asuncion, Paraguay gathered in front of one of the major shopping malls of Asuncion with candles forming the number “60” and a drum batcada making a powerful unplugged fiesta in celebration of Earth Hour 2010. Amateur astronomers offered their support to produce a makeshift observatory to seize the darkness while historical landmarks such as the Cabildo, Palacio de López and Palacio de López also dimmed, surpassing local organizers expectations. Similarly in Uruguay, two Montevideo residents led the charge for their country to take part in the global Earth Hour relay for the first time this year, securing support from the Municipal Council of Montevideo and additional corporate support. Entertainment venue Conrad Punta del Este shut off its external decorative lights. In Buenos Aires, Argentina, landmarks switching off for Earth Hour included landmarks such as the Manzana de las luces, Palacio Barolo and Monumento a los Españoles turned their lights off to mark Earth Hour 2010. On the night, a ‘big switch’ prop was placed in Obelisco where the city mayor marked the beginning of the hour by switching it off. Volunteers then spent the hour assembling the Earth Hour logo with candles and celebrating Earth Hour in a party atmosphere. Across the Andes, Chileans took part in Earth Hour despite the hardships of the February earthquakes. Island states of the Caribbean and elsewhere also took part in Earth Hour. In Bermuda, the grass-roots movement was led by local environmental NGO Greenrock and centred on the city of Hamilton, with awareness raising activities coupled with music and a performance by Capoeira dancers. In another, more remote outpost of empire, Falkland Islands member of parliament Emma Edwards staged an official Earth Hour event at Whalebone Arch in the Falkland Islands. The Islands already source around 60 per cent of their power from wind farms. Thirty school children and girl scouts took part in the event, underlining the need for action on climate change to protect the planet for younger generations. Ecuador participated in its first ever Earth Hour this year with a lights out ceremony in Old Town Quito on the Plaza de la Independiencia surrounded by the Government Palace, the Archbishop's Palace, the Metropolitan Cathedral and the headquarters of the Municipality of Quito. Among the keenest participants was the new WWF International President, Yolanda Kakabadse, a former Ecuadorian Environment Minister with a long and distinguished career in resolving environmental and other conflicts between policy makers, industry and social groups. © Jeremiah Armstrong/WWF-Canada. All rights reserved.